The Denver conference brought some great cheeses under one roof. From July 26–29, I traveled to Denver, Colorado to attend the 34th annual American Cheese Society Conference and Judging, cheekily entitled “Cheese with Altitude.” It was the perfect opportunity to see so many old cheese friends – from New York, San Francisco, and all points in between – and make some new ones as well. And then there was the cheese; so much great cheese. This year’s conference had a full roster of networking salons, scientific seminars, expert guest speakers, and gourmet tastings geared toward cheesemakers, retailers, restaurateurs and marketers. There was a class on pairing beers and chocolate (!) with cheese; an illuminating seminar on what defines the term “grassfed;” and a panel on the logistics of e-commerce for producers, which is becoming a huge part of cheese sales. There were sessions geared towards independent cheese retailers, focusing on the daily challenges they face; classes for cheesemongers; and seminars on the environmental impact of cheesemaking and how to leave less of a footprint. One of my favorite events was “Meet the Cheesemaker,” a chance to speak to the people who make cheese (over 80 of them) and to sample their own cheeses with them. I love tasting cheese in this format, where you can directly ask the producer about age, rind, the cheese’s ideal age for consumption, etc. Another event I loved was a “Meet the Author” session, where I caught up with three of my favorite cheese writers: Tia Keenan, who wrote a stellar book on cheese plates and pairings last year; Gordon Edgar, from San Francisco’s Rainbow Grocery co-op, who has written a book devoted solely to cheddar and the fantastic Cheesemonger: A Life on the Wedge; and Janet Fletcher, who is the author of dozens of cheese books and writes un unmatched weekly cheese column for the San Francisco Chronicle. The main event of the conference is the Festival of Cheese. Imagine a room as big as a football field, with countless tables overflowing with cheeses: yes, it’s paradise. There were samples of all the 2000+ cheeses that had been entered into the judging. It’s an all-you-can-eat (and believe me, I tried) opportunity to sample the best-of-the-best American cheeses. 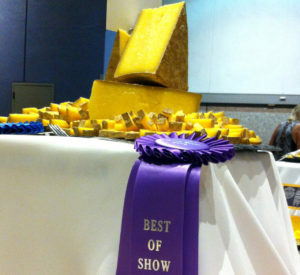 The judging is done by some exceedingly qualified cheese pros, who chose Tarentaise Reserve from the Farms for City Kids Foundation & Spring Brook Farm in Vermont as this year’s Best of Show winner. It was absolutely delectable and so deserving of the honor. Next year’s ACS Conference will be held in Pittsburgh, Pennsylvania, and the theme is “Forged in Cheese.” I highly recommend attending to cheese business folks and cheese enthusiasts alike.